Book a dream escape at The Bahia Principe Tenerife and treat yourself to stunning views of the Atlantic and La Gomera island. This 220-room seafront property, set on the southern tip of Paradise Beach in Costa Adeje, covers an expanse of 22,000sq m, offers easy access to the famous Adeje Cliffs of Los Gigantes and the golf course. The rooms, all facing the sea, are set apart in three four-story blocks. Look out at sweeping views of the Atlantic, drink in hand, while sampling Canarian tapas, Mediterranean grills and a variety of international cuisine at the in-house restaurants and bars. Treat yourself to an outdoor spa in a gazebo and spend time in the pool with a swim-up bar at hand. 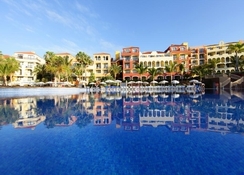 The Bahia Principe Tenerife is located on the beach in Costa Adeje, within a few miles from the Ajabo beach and the golf course. The resort is within 10km of the Aqualand waterpark. Be greeted by a picture-perfect Tenerife landscape, with views of the turqouise sea and rugged mountains from your room, housed in romantic four-story classic Spanish villa. Choose from Standard, Junior Suite and Junior Suite Sea Side, which accommodate a maximum of 3 adults or 2 adults/2 children. The hotel also offers four rooms that cater to the handicapped. The Bahia Principe Tenerife offers buffet options as well an a la carte menu in its restaurants and bars, which cater to all tastes. Enjoy an international buffet at the Teide restaurant, fun fusion at the Asia restaurant and traditional Mexican fare with tequila cocktails to match, at Dona Lupita. There are several bars, including pool bars, where you soak up the magical scenery with a drink in your hand. Soak up the sun on the beach with views of the Atlantic, explore secluded coves and in the evenings, you can swing to live Spanish tunes at the hotel. Take in a live show at the La Plaza sports bar and dance all night at the disco. If you enjoy golf, there’s a 27-hole course located at a 10 minute drive from the hotel. Enrol your kids as Bahia Scouts, which gives them access to a mini-club, private pool and other kid-friendly activities. You can also play table tennis, pool, football or squash; de-stress in the Jacuzzi and get a massage at the health spa. Please Note : The Hotel has Closed Sauna with the immaediate Effect. 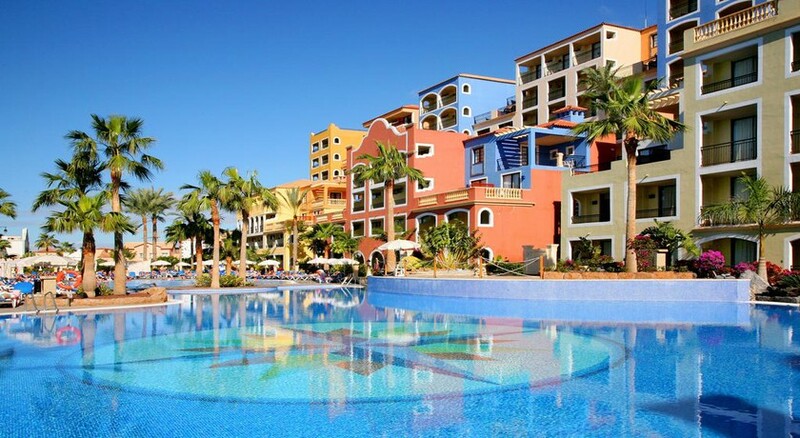 Pueblo Principe commercial and entertainment village (located in the Bahia Principe Costa Adeje) offering: billiards, shops, hairdresser, various entertainment, live music, shows, 'La Plaza' sports bar and disco and more. Stayed here in Feb 2018. Had a wonderful time. Hotel is huge but very well kept. Very clean too. All staff are friendly and couldn’t do enough for us. I would highly recommend this hotel. 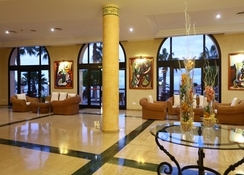 This was our second time at the Bahia Principe resort and unfortunately did not match the expectation. The entertainment for the kids was nothing special but rather bland. We woke up one day with one cockroach crawling on our heads and pillow. Not sure on what to do with it, we trapped under a glass for the staff to clear. We asked at the reception for a different room or alternatively to spray the room. With our utter disgust neither one or the other were done and at our return in the room at the evening the cockroach was still there under the glass. In more than one occasion staff at the table were very slow to help, one morning for example we had to ask 6 times for milk and coffee but no avail and we gave up eventually. For a rated hotel and the money we spent we expected something more as a service.